Lets pretend that the entire United States is filled with zombies. If I ever meet a real-life zombie, I'm probably going to start crying. I won't even be able to run away, because my legs will become useless from panic. I'll just flop around on the ground, trying to slap the zombie away as he slowly chows down on my quadriceps. But whenever I run across a video game zombie, I'm barely fazed. I've played so many zombie-themed titles that the undead are almost background noise at this point. They're part of the scenery. They establish the mood. 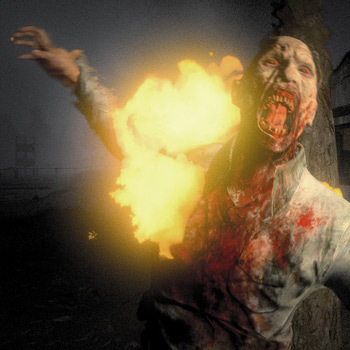 So, when I sat down to play H1Z1, I was pleasantly surprised when SOE game designer Adam Clegg described the title's zombies as "part of the background." H1Z1 isn't about zombies. It's a game about the way that humans interact during a crisis. The zombies are constantly putting pressure on the players, but as long as you don't play like an idiot, they're probably not going to kill you. The humans, however, are a very different story. "Think of being dropped in the middle of the woods, like on Man Vs. Wild," Clegg explains. "You start with nothing. You're trying to survive. But there's also zombies." If you're not familiar with H1Z1, here's what you need to know: it's a first-person MMO that was announced just three months ago. The game is currently in a pre-alpha state, but it already has a flavor that's unique. The crafting tree, for example, is resource-based. So, if you want to level your woodworking skills, you'll need to chop down a tree and collect some logs. With the logs, you'll learn to create planks. With the planks, you'll learn to create sticks, and sticks can be turned into arrows. Anything you find on the ground could potentially have its own unique skill tree. So, with a little effort, you could be turning animal fat into gasoline in no time. Resources are scarce, which means that other players will view your shanty as a treasure trove of goodies. So, Clegg is encouraging everyone to find a crew of "trusted friends," to safeguard your supplies (and life) from would-be raiders (and murderers). And if you don't have any friends, you can always bury your stuff in a hole. Seriously. When it's released, H1Z1 won't be the most expansive MMO on the planet, but Sony Online Entertainment has big plans for the future. "Right now, the world is 64 square kilometers, but we're currently working on tech that would allow us to expand as large as we want to go," Clegg says. "Our president actually says that a [world as big as] the United States is where we'd like to end up." H1Z1 is built on Planetside 2's Forgelight Engine, so a persistent world as large as the United States would not be out of the question. But it's probably not going to be viable in the near future. After all, Clegg's team needs to finish the Alpha version of the game, and they still have a lot of work to do. "We have a huge white board in our office right now, and it has a check list of all the things that we want in the game before [the alpha]," Clegg says. "No one on the team can add anything to that, and no one on the team can remove anything from that. Once those are done, that's the alpha."